Recently, the women’s Bible study at my church is focused on “The Bib le” television series, and may I say, I did watch it back in the spring and it was really good. Anyway, today’s lesson was focused on the story of David and Goliath and we watched that particular clip from the series. 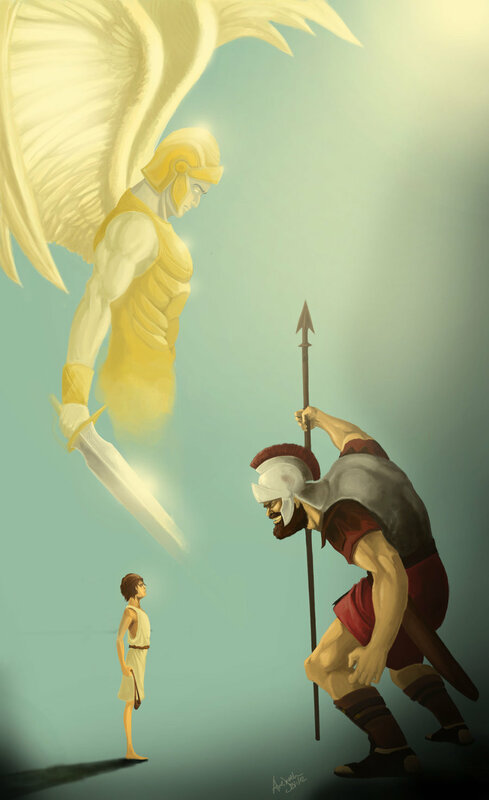 Now, David and Goliath is one of the most familiar and prominent stories in and out of the church, so it’s not as if I had never heard it before or heard it used in whatever form of analogy, quite the opposite. Still the great thing about Scripture, is that the more you read, the more God reveals to you, and tonight was no different. As I was watching the clip where David volunteered to fight Goliath and just about everyone, the Israelites included, thought he was out of his mind, but that’s when I begin to think. Whenever God calls us to go up against our Goliath as he begins to orchestrate the purpose He has for us, we should do it with a smile and with great expectation, because the moment God uses something so small to accomplish a task so big, He must be ready to do a miracle. On the flip side, you may not be the David in a situation, but you do begin to see God just doing crazy stuff that makes no type of sense, things that seem so small and insignificant to carry out the greatest of tasks in the midst of other more logical possibilities, anticipate that God is about to do something more than amazing. When you see him bless 5 stones, as a believer in Yahweh. we should smile understanding that God is about to move in an marvelous, miraculous. and incredible way. As the people laughed and questioned what David was doing, remember that God enjoys proving Himself, so stay faithful and trust God even if all you have is 5 loaves and 2 fish, and watch Him multiply to feed 15,000, or if all you have is 5 stones, watch God use one to kill your giant and ultimately defeat whatever army is against you. When you walk in purpose, God will lead you to do some crazy stuff and or will allow you to see Him doing some off the wall things. Don’t fret. God likes to show off. So let Him.